Thailand is South East ﻿﻿Asia’s most popular destination and with modern cities, pristine beaches and impressive countryside it is not hard to see why. With such a great variety of things to see and do in Thailand many people ask is one week in Thailand enough time? And that is such a difficult question to answer! If you spend your time wisely, plan a one week in Thailand itinerary in advance and stick to it then you can cover ‘the basics’ of Thailand in one week. Beach holidays are a popular option for many who have just one week in Thailand but with easy and affordable public transport it is possible to over a lot of ground in one week in Thailand, ticking off as many sights and attractions as possible. Here are our top tips for what to do in one week in Thailand and where to go! 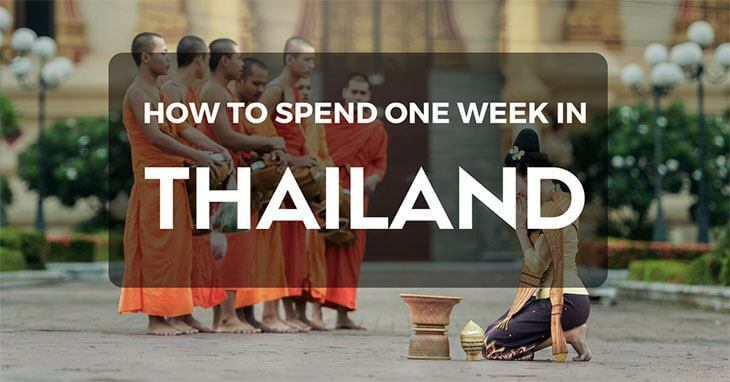 With just one week in Thailand you can chose to splurge or save! Thailand is an integral part of the South East Asia backpacking route and as such is home to hundreds of super cool hostels and guesthouses, starting from just $3 a night! With street food on every corner eating out doesn't have to break the bank and swimming in the sea and sunbathing will forever be free. In that respect, not including flights, you could spend one week in Thailand for less than $250 and still feel like you’ve lived like a King. For those who really do want to live like Kings then one week in Thailand can cost the earth! Travel in private cars, eat at the best luxury restaurants in town and stay at the best suite at a 5 Star hotel that just to happens to have its own private beach for you to enjoy. When you have just one week in Thailand where to go is a key question. Easy answer…the beach. With some of the world’s best beaches you would be a fool not to head to the coast during your time in Thailand. Phuket is a popular beach holiday destination for many travellers and is a well designed tourist destination. With pristine beaches and clear blue seas Phuket has been Thailand’s beach hot spot for decades. Restaurants and bars that line the beach front are well versed in the needs of the traveler and serve western food and traditional Thai dishes. Menus are available in English too for complete ease of ordering. Phuket is a great way to spend one week in Thailand to kick back, relax and soak up the sun. With live music every night and full moon parties every month you will certainly have a memorable experience in Phuket regardless of your budget! 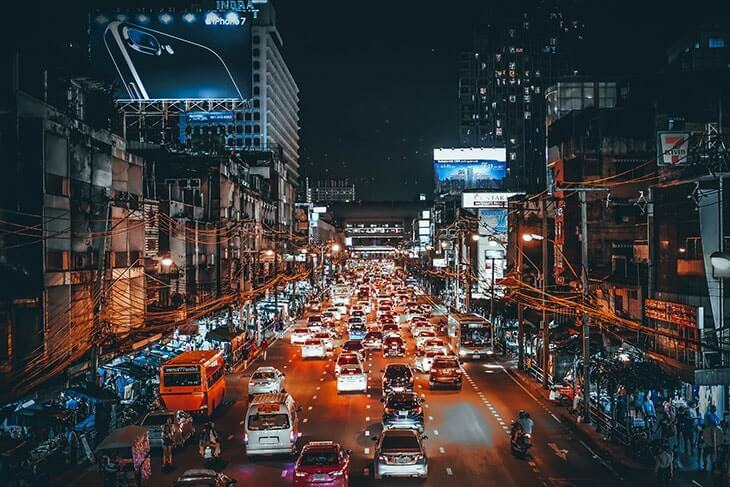 In terms of what to do for one week in Thailand you can't go far wrong by choosing Phuket, with Phuket Old Town opening every night for Thailand’s famous night markets you won’t be going home empty handed. Thailand’s night markets are full of quality and quirky souvenirs to purchase so you can keep a piece of Thailand with you wherever you go! 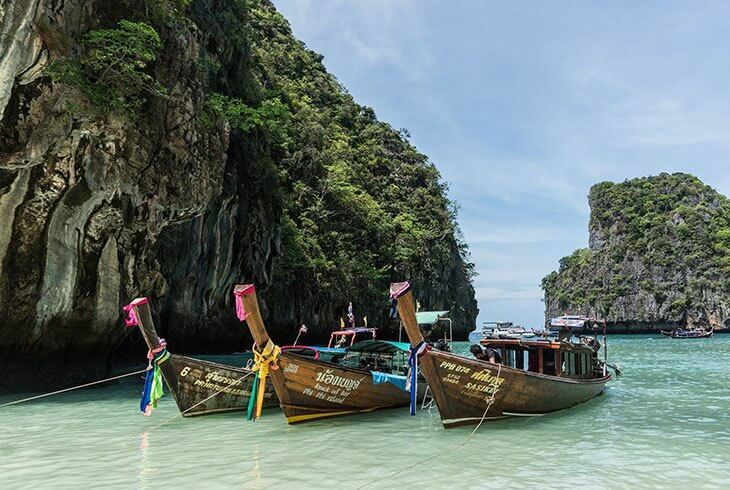 If a beach holiday is your thing but you don't fancy staying in one place then island hopping is the choice for you and one week in Thailand is the perfect amount of time to explore the islands of the Andaman Sea at your own pace. Koh means island in Thai and as such all the islands are names Koh…something! Koh Phi Phi is are the most popular collection of islands and are in fact protected National Parks. Immaculate, vast empty beaches than meet cool blue seas produce simple breathtaking coastal vistas at Koh Phi Phi, not to mention the palm trees that are just asking to have a hammock tied to them! Maya Beach on Koh Phi Phi became world famous when it was used as the backdrop for Leonardo Di Caprio’s The Beach and attracts visitors from the world over for that very reason. Smaller more remote islands like Koh Chang or Poda Island are great for diving and snorkelling. Many tour companies on the main land run daily boat tours to the best snorkelling spots around the islands and provide all the kit you need. You could set yourself a rigorous itinerary before you begin your journey to Thailand but when it comes to island hopping go with the flow, head to the beach in the early morning and chat to the boatman and see where they are headed today…a bit of insider knowledge can go a long way too and they may even take you to some secret snorkelling spots! East meets West in Thailands buzzing capital Bangkok. Home to eight million people you will always be able to find a friend in Bangko﻿k. You could easily spend your one week in Thailand in Bangkok, with temples, museums, markets and more to explore! Obviously the cost of living in Bangkok is steeper than on the islands but for city lovers Bangkok has plenty on offer at very reasonable prices. Street food and staying at budget hostels are an easy way to keep costs down but if you have a bigger budget there are a great range of mid to high end hotels to choose from, many that boast impressive cityscape views and swimming pools. Although incredibly cliched, no trip to Bangkok would be complete without a trip to Khao San Road, if the South East Asia backpacking route had a beating heart it would be in the form of Khao San Road. From travellers fresh off the plane to the hippies of the 70s that arrived and never left Khao San Road is a great way to let your hair down and party the nights of your one week in Thailand away. For those who are seeking a more spiritual and cultural experience then Bangkok’s wonderful Buddhist temples complexes are a must visit. Aside from the Grand Palace with its breathtaking bejewelled exterior and ornate internal decor there are a number of other temples that are equally as impressive on a smaller scale. Wat Arun with its steep steps and traditional architecture offers views of Chao Phraya and the city panorama. Wat Pho is home to the golden reclining Buddha which is sight to behold. A destination of great scared significance to Buddhists enter the temple with respect and calmness in mind. The temples of Thailand welcome visitors of any faith provided the are respectfully dressed and allow others to perform their religious rituals in peace. 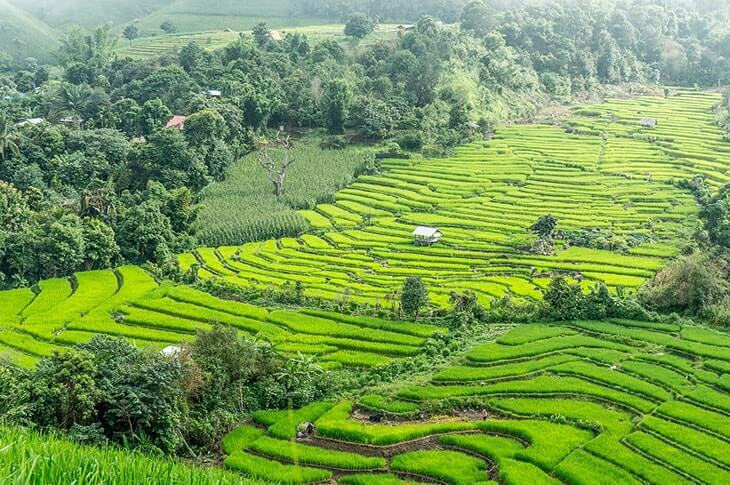 Chiang Mai is Thailand’s relaxed and laid back second city located eight hours North of Bangkok. Easily accessible by night bus, train or flight Chiang Mai is the perfect mix of city living, culture and night-life. The best night markets can be found in Chiang Mai and although the biggest market is ran on Sunday nights there are stalls open every night in the market complex. Chiang Mai is famed for Muay Thai and is a great place to get yourself in shape. Enroll on a one week Muay Thai boot camp or if you just fancy a taster session sign up for a one hour introduction and one of the many Muay Thai gyms spread about the city. If those of you how see their one week in Thailand as a more passive affair get yourself tickets to a live May Thai match and cheer along from the side lines. Many profession Muay Thai boxers from around the world come to Chiang Mai to train so it’s very likely you’ll get the chance to see a fighter from your home country perform! Chiang Mai is a foodie’s paradise! From freshly fried street food to little vegan cafes for those who have visited before you just uttering the words Chiang Mai will get their mouths watering! This 24-hour city has food available around the clock, in that respect one week in Thailand is not enough if you want to experience all the food on offer! One week in Thailand will never been enough, this wondrous country will forever have you coming back for more. With a planned one week itinerary and an open mind you can achieve a lot in just one week in Thailand. From islands to cities, from snorkelling to night markets you certainly won’t have a dull moment is South East Asia’s most popular tourist destination.